The CALS experience is found in our classrooms and beyond — in the various exploratory and outreach facilities open to CALS students, faculty and the general public. Check out the sites below and plan your visit to the CALS campus. Click here to explore visit opportunities such as housing tours and more! 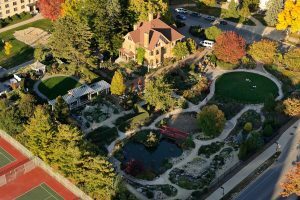 Allen Centennial Garden — Created on the 2.5-acre site of a historic Victorian home that once served as a residence for the CALS dean, the gardens have been called UW-Madison’s largest outdoor classroom. The 22 gardens are maintained by UW faculty, staff and students, and represent gardening styles from around the world. Babcock Hall Dairy Store and Plant — A campus landmark for generations of Badgers, Babcock Hall makes and sells popular ice creams and cheeses, as well as other dairy products. The dairy store features coffee and lunch specials on most days. Visitors can observe work in the dairy plant from an observation deck on the second floor of Babcock Hall. D.C. Smith Greenhouse — Completed in 1996, D.C. Smith Greenhouse features 10,000 square feet of ornamental plants and varieties in an award-winning glass-walled structure. The conservatory is a popular place to retreat during winter months to enjoy a bit of tropical warmth. Forest Products Laboratory — Managed by the U.S. Department of Agriculture, this facility conducts research on wood products and fiber utilization, often in collaboration with CALS researchers and students. Tours are available by appointment. History Plaques — Nineteen plaques on and around Henry Mall mark the sites of some of the biggest scientific achievements made by CALS scientists during the past century. Insect Research Collection — From enormous tropical African beetles to brilliant butterflies, the Insect Research Collection is a treasure trove for nature lovers. 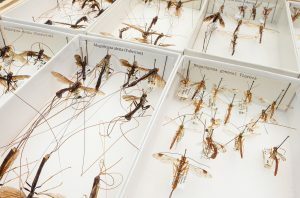 The collection contains about two million preserved insects, including huge cicadas from Africa and Malaysia. There are also live Madagascar hissing and death’s head cockroaches and a four-inch long Chilean rosehair tarantula. Tours are available by appointment for up to 10 people. Currie Lab — Located on the first floor of the Microbial Science Building, this walk-in exhibit opens a window into the role of microbes in our lives. Visitors can watch a colony of Central American leaf-cutting ants, which count on the assistance of various microbes to break down leaves for food. West Madison Agricultural Research Station Gardens — Located on the far west side of Madison eight miles from campus, this facility features demonstration gardens including many varieties of flowers, fruits and vegetable plants. The gardens are open dawn to dusk every day and host several large public events throughout the year.